150 x 125 mm place all rubbish in bins self adhesive vinyl labels. UK mandatory signs - 150 x 125 mm place all rubbish in bins self adhesive vinyl labels. 100 x 250 mm place all rubbish in bins self adhesive vinyl labels. UK mandatory signs - 100 x 250 mm place all rubbish in bins self adhesive vinyl labels. 150 x 125 mm place all rubbish in bins 1.2 mm rigid plastic signs. UK mandatory signs - 150 x 125 mm place all rubbish in bins 1.2 mm rigid plastic signs. A5 place all rubbish in bins provided self adhesive vinyl labels. UK mandatory signs - A5 place all rubbish in bins provided self adhesive vinyl labels. A5 place all rubbish in bins provided 1.2 mm rigid plastic signs. 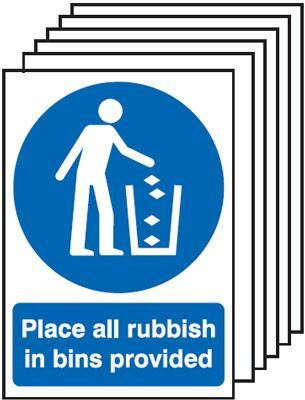 UK mandatory signs - A5 place all rubbish in bins provided 1.2 mm rigid plastic signs. 100 x 250 mm place all rubbish in bins 1.2 mm rigid plastic signs. UK mandatory signs - 100 x 250 mm place all rubbish in bins 1.2 mm rigid plastic signs. 300 x 250 mm place all rubbish in bins self adhesive vinyl labels. UK mandatory signs - 300 x 250 mm place all rubbish in bins self adhesive vinyl labels. 400 x 300 mm place all rubbish in bins provide self adhesive vinyl labels. UK mandatory signs - 400 x 300 mm place all rubbish in bins provid self adhesive vinyl labels. A4 place all rubbish in bins provided self adhesive vinyl labels. UK mandatory signs - A4 place all rubbish in bins provided self adhesive vinyl labels. A3 place all rubbish in bins provided self adhesive vinyl labels. UK mandatory signs - A3 place all rubbish in bins provided self adhesive vinyl labels. 150 x 125 mm place all rubbish in bins 1.2 mm rigid plastic signs with s/a backing. UK mandatory signs - 150 x 125 mm place all rubbish in bins 1.2 mm rigid plastic signs with self adhesive backing. 300 x 250 mm place all rubbish in bins 1.2 mm rigid plastic signs. UK mandatory signs - 300 x 250 mm place all rubbish in bins 1.2 mm rigid plastic signs. A4 place all rubbish in bins provided 1.2 mm rigid plastic signs. UK mandatory signs - A4 place all rubbish in bins provided 1.2 mm rigid plastic signs. 400 x 300 mm place all rubbish in bins provide 1.2 mm rigid plastic signs. 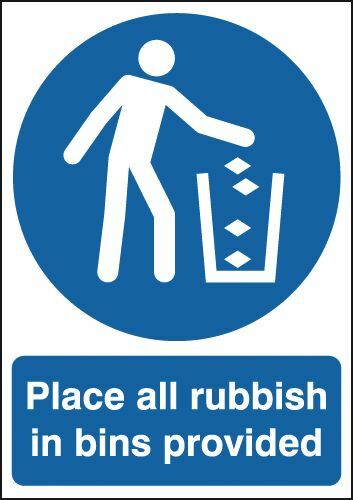 UK mandatory signs - 400 x 300 mm place all rubbish in bins provid 1.2 mm rigid plastic signs. A3 place all rubbish in bins provided 1.2 mm rigid plastic signs. UK mandatory signs - A3 place all rubbish in bins provided 1.2 mm rigid plastic signs. A5 place all rubbish in bins provided 1.2 mm rigid plastic signs with s/a backing. UK mandatory signs - A5 place all rubbish in bins provided 1.2 mm rigid plastic signs with self adhesive backing. A2 420 x 598 mm place all rubbish in bins provided self adhesive vinyl labels. UK mandatory signs - A2 place all rubbish in bins provided self adhesive vinyl labels. 300 x 250 mm place all rubbish in bins 1.2 mm rigid plastic signs with s/a backing. UK mandatory signs - 300 x 250 mm place all rubbish in bins 1.2 mm rigid plastic signs with self adhesive backing. A2 420 x 598 mm place all rubbish in bins provided 1.2 mm rigid plastic signs. UK mandatory signs - A2 place all rubbish in bins provided 1.2 mm rigid plastic signs. A1 place all rubbish in bins provided self adhesive vinyl labels. UK mandatory signs - A1 place all rubbish in bins provided self adhesive vinyl labels. A1 place all rubbish in bins provided 1.2 mm rigid plastic signs. UK mandatory signs - A1 place all rubbish in bins provided 1.2 mm rigid plastic signs. A3 place all rubbish in bins provided 1.2 mm rigid plastic signs with s/a backing. UK mandatory signs - A3 place all rubbish in bins provided 1.2 mm rigid plastic signs with self adhesive backing. A2 420 x 598 mm place all rubbish in bins provided 1.2 mm rigid plastic signs with s/a backing. UK mandatory signs - A2 place all rubbish in bins provided 1.2 mm rigid plastic signs with self adhesive backing. A1 place all rubbish in bins provided 1.2 mm rigid plastic signs with s/a backing. UK mandatory signs - A1 place all rubbish in bins provided 1.2 mm rigid plastic signs with self adhesive backing. A4 place all rubbish in bins provided 1.2 mm rigid plastic signs with s/a backing. UK mandatory signs - A4 place all rubbish in bins provided 1.2 mm rigid plastic signs with self adhesive backing.